Loyal readers will already know that I love me some lip balm. Pot, stick, tube ... it doesn't matter. If it's a balm, chances are I've tried it and loved it. Yes, I have some favorites that stick out among the others. But at the end of the day, give me a good lip balm over a sparkly eyeshadow any day. (Though of course I love sparkly eyeshadow, too.) What am I getting at here? Oh, just that La Mer The Lip Balm is one of the greatest products I've had the pleasure of trying recently, that's all. 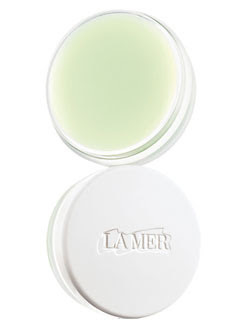 Now, when La Mer describes this balm as "a luxurious emulsion that helps lips look and feel smoother and softer," they really aren't kidding. Formulated with the brand's patented Miracle Broth, this balm works to condition, moisturize and smooth lips until they're softer than you ever imagined they could be. Dramatic? Yes. True? Absolutely. Add to that the subtle minty taste and you've got yourself one unbelievably amazing balm. I've tried the balm at night, I've tried it in the morning, I've tried it in the afternoon ... all with the same results. It lasts for hours, it doesn't cake or start to feel crunchy, it doesn't feel too goopy or gloppy. It just makes lips feel incredible. La Mer The Lip Balm retails for $50 at blissworld.com.